Montreal pop star Coeur de Pirate lit up the Plateau on March 16 with an orchestral spectacle at the majestic Église St-Jean-Baptiste, alongside local musicians the Molinari Quartet. I was lucky enough to catch her live a few years ago at Metropolis fresh off of the release of her album Roses, and once again she did not disappoint at this latest outing. 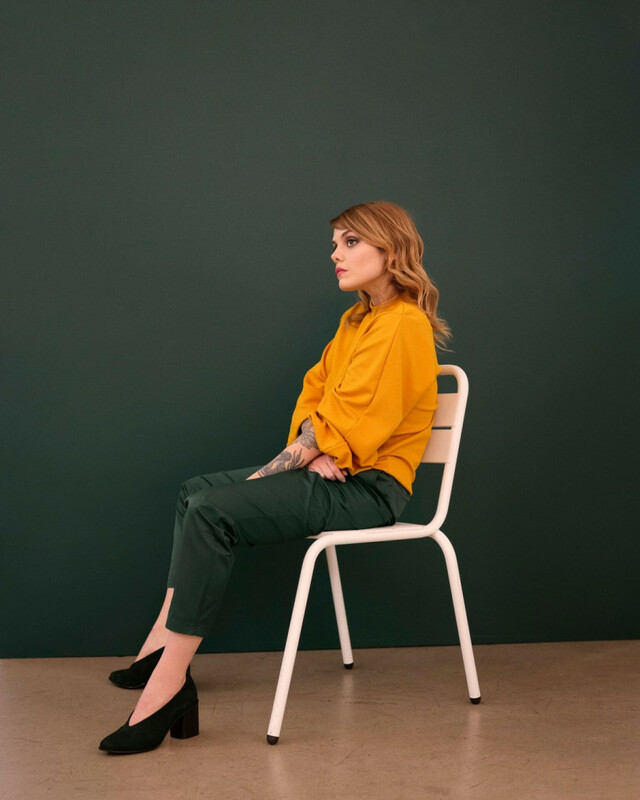 It’s been a hectic few years for Béatrice Martin, aka Coeur de Pirate. Since I last saw her in 2016, she had separated from her husband, came out as queer following the Orlando Pulse nightclub shooting, appeared as a judge on the French singing reality competition series Nouvelle Star, and even contemplated quitting music after an exhausting and emotionally draining year and a half of touring following Roses. But last night, she proved she was in full form with this special acoustic/orchestral set, and treated Montrealers to a few unreleased songs from her upcoming currently unnamed fourth full-length album. The venue, Église St-Jean-Baptiste, is nestled in the Plateau by St. Denis and Rachel Streets, just a few blocks from Mont-Royal metro. The church is cavernous and grandiose in true Montreal fashion, built in 1875 and boasting beautiful Baroque architecture and stained glass art. The pews were kept in place and used as seating for the show, completing the illusion that we were filing in for a mass to listen to the good word of the goddess of pop. The show began with a haunting melancholic piece from the Molinari Quartet, which I later discovered was a transposed piece by Martin herself for the videogame Child of Light. The quartet is made up of a viola, two violins, and a cello, yet their sound filled the space as if they were a full orchestra while still remaining intimate and not overpowering, a healthy balance. The opening song, “Pilgrims On a Long Journey,” was enchanting, but I couldn’t help feeling it was a bit too gloomy to start off a show. But then Martin came out in a black dress to thunderous applause and I was reassured that spirits were still high. I was once again floored by her live singing ability—she sounded exactly like she does on her records, the same sweetly honeyed and slightly breathy style. This leads me to believe that the producers for her vocals in the studio have one of the easiest jobs in the world. She showed off her prowess on the grand piano as usual, and I was very impressed at her clearly overflowing musical talent. With no distortion or screaming crowd to hide behind (the crowd remained hushed throughout the songs), her musical ability was laid bare, and she crushed it. There were even a few solo songs with no backing instruments at all, and they all sounded equally lovely. There are pros and cons to an orchestral concert such as this, however. While I did love the serene space and being able to hear Martin’s harmonies and melodies flowing out of stringed instruments, I sorely missed any kind of percussion and bass to groove along to. I enjoy the typical show experience of sweating profusely, screaming along to lyrics, and jostling against bodies—a physical experience as well as a sonic one. Seeing an orchestra live in a church is much more reserved and austere, obviously. But once I accepted that there would be no moshing or singing along to Martin’s music, I was able to adjust and silently enjoy the very different type of show experience. She stated that this song was “very difficult to play.” It was clearly a very private song that must have taken a lot of courage to share—the applause was stronger than ever after that one. She concluded the show with “Crier Tout Bas” which sounded positively epic on strings, then came back for encore number one with “Comme des Enfants” and “Oublie-Moi.” Finally, she finished out the night in encore number two with her new single “Prémonition,” for which she recently released a music video. It was a fantastic show and a truly magical evening; I felt very lucky to be a part of it. I look forward to seeing what she does next. Coeur de Pirate // MTELUS (59 St. Catherine E) // September 6, 2018 // 8 p.m.